Learn how server virtualization is achieved and how a virtual infrastructure is built using VMware&apos;s products and solutions. This is a book for any experienced technologist who is new to the realm of Data Center virtualization wanting to find a way to get a head start in learning how to design, implement and manage a modern day datacenter virtualized using VMware&apos;s core infrastructure solutions. It could also act a comprehensive reference guide for Infrastructure Architects and System Administrators to aid them in their day to day activities. This book could easily find its place in reference materials used by professionals for VCP and VCAP certification exams. Keep in mind however that the book is not written to follow as a blueprint for either of the exams. Computer virtualization is a method to enable the running of multiple application workloads on a machine to achieve efficient utilization and reduce the number of physical machines in a data center. This has now become the foundation of many modern day data centers. What began as a technology to virtualize x86 architecture has now grown beyond the limits of a server&apos;s hardware and into the realm of storage and network virtualization. VMware is currently the market leader in developing data center virtualization solutions. The book begins by introducing you to the concepts of server virtualization followed by the architecture of VMware&apos;s hypervisor – ESXi and then by its installation and configuration. You then learn what is required to manage a vSphere environment and configure advanced management capabilities of vCenter. Next you are taken through topics on vSphere Networking, Storage, ESXi Clustering, Resource Management and Virtual Machine Management. You will then be introduced to SSL Certificate Management and its use in a vSphere environment. Finally, you will learn about the lifecycle management of a vSphere environment by effectively monitoring, patching and upgrading vSphere components using Update Manager. 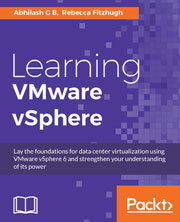 By the end of the book, you will know how to use VMware&apos;s vSphere suite of components to lay the foundation of a modern day virtual infrastructure.